Special events professionals know this. They do their best to make events surprisingly spectacular, typically focusing on food & beverage, decor, entertainment, and, occasionally, format. In the realm of conferences and professional meetings however, it’s easy to forget the value of surprising attendees. We’ve all been to meetings that followed the dreary welcome-presentations-meals-socials-closing remarks routine. Every minute is scheduled in advance, and attendees are told in advance everything that’s going to happen. To improve attendee experience, we need to not only minimize unexpected surprises, but also incorporate planned surprises into our events. And we don’t have to limit ourselves to the standard “surprising” elements that typical special events include. Here are three ways to create truly surprising meetings. Each February I fly to Europe to attend the annual Meeting Design Practicum: an intense, immersive, invitation-only conference for thirty creative meeting designers. The genius of this conference is that only one person, my friend and colleague Eric de Groot, knows everything that will happen during our 48 hours together. First, Eric and his MindMeeting crew come up with a metaphor for the conference. Then they solicit individual attendees to design and facilitate (typically experimental) sessions that collectively reflect and explore the chosen frame. Participants know what they will contribute, but nothing else about the program. For example, in 2017 we convened at a Barcelona food market. We had no idea that within a few minutes we would be partnered up and choosing exotic food items on display for our new friend to taste, let alone being whisked away in a coach an hour later to Lloret de Mar for the remainder of the conference—with the rest of the program still a mystery. As you might expect, the continuous unfolding of the entire event added greatly to participants’ enjoyment and engagement. You probably won’t want to do this for a conventional content-focused event. But meetings where the session designs use active, interactive learning can be made far more engaging if individual presenters are prepared for their sessions but only the event organizers know everything that will occur. I’ve been taking yoga classes for decades with the genial Scott Willis. Our 75-minute yoga flow is pretty standard from week to week (and for me, on balance, that’s a good thing). But yesterday, I climbed the stairs to Scott’s yoga studio and found a jar of mayonnaise on the floor. I won’t recount in detail what happened next. Suffice it to say there was general merriment for a few minutes while the origins and convoluted journey of the jar were explored and explained. A little bit of spontaneous color never hurts even a mostly predictable an event. In case you were wondering, I got to bring home the jar. Another example of being open to novel possibilities is my story of the man who brought bagpipes to my event. 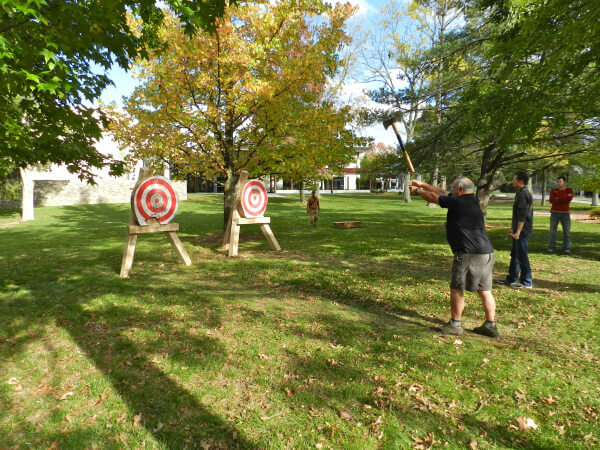 [Added June 18, 2018] Traci Browne (see comments) kindly reminded me of our pleasure when we stumbled across an unexpected axe throwing competition during a 2012 conference. Finally, we can create a genuinely surprising session by seeing what the event environment evokes. At the 2017 Meeting Design Practicum mentioned above, Manu Prina noticed a children’s playground outside our hotel, so she developed a 4-corner game played (literally!) in the sandbox! her starting point was a child’s game, with movement, simple rules, and moments of playful competition. She used it to brainstorm ideas about a problem the group was working on. The archetypal space and our memories of play as children combined to create a joyful and totally novel experience for us to work together. That’s creativity! Make your meetings surprising — in a good way! I hope these examples stimulate your thinking about ways to improve your event design. Besides these approaches being intuitively appealing, we also know that novel surprises stimulate learning because we are wired to notice novelty. Creating formats that surprise attendees, and in the process help them learn more effectively, is harder than, say, selecting linens. But well worth the effort! This entry was posted on Monday, June 18th, 2018 at 6:35 am	and is filed under Event design. You can follow any responses to this entry through the RSS 2.0 feed.You can leave a response, or trackback from your own site.